Our beef is much leaner, and more flavorful. Find out why. One thing few consumers realize is that when they're buying store-bought chicken, its weight has often been artificially boosted with chlorinated ice-water. When chickens are slaughtered their carcasses need to be rapidly chilled from around 100 degrees (F) down to 40 degrees. This is to prevent bacterial growth and spoilage. The method used by most slaughter-facilities to chill the birds is an ice-cold chlorinated water bath which is a large communal tub. This is a cheap and effective way to chill the carcasses, but it has several drawbacks. First, the carcasses act like sponges and soak-up the chlorinated water. Therefore when you buy water-chilled chicken its weight is increased artificially by sometimes up to 10 percent, resulting in you paying extra for chlorinated water rather than meat. Second, the extra weight in chlorinated water ends up affecting the taste of the meat. This isn't surprising. Many of you know that water-bathing a turkey or chicken in a salt-water brine prior to cooking will result in enhanced flavor and tenderness. But can you imagine using chlorine water instead of salt-brine? Third, the skin of a water-chilled chicken is less crispy. While some people don't care about this, others do. Personally we like the skin. Remember, it contains certain nutrients which aren't found in muscle tissue. 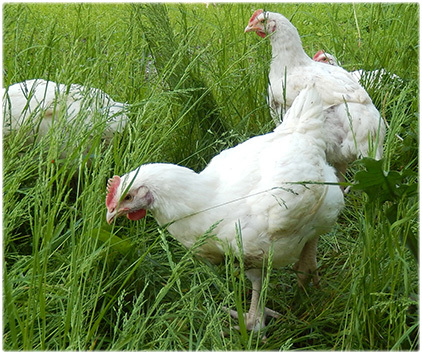 Fourth, water-chilled chicken results in a lower-yield of cooked meat. That just means you'll lose all that extra water as you cook it. You won't however lose all the chlorine. Is there an alternative to water-chilling? Yes, it's air-chilling and the Europeans have been doing it for decades, but it still hasn't quite caught on yet in North America. Probably because it's more expensive. Most slaughter facilities in Canada and the US still use the water-chilling method. Our chicken is not only air-chilled but is also certified organic, soy-free, and certified humane. First, it's a better tasting meat. We can verify this ourselves, our air-chilled chicken tastes more "chickeny" as you would expect it should. Second, the skin is crispier and this is important not only for taste but also presentation, especially when cooking an entire roast chicken. Third, you are paying for what you want (healthy meat), and not chlorinated water. This is an obvious but important benefit of air-chilled chicken. Fourth, for those who are chlorine-sensitive (which is probably everybody) it is essential to reduce exposure. This is easier said than done because chlorine-use is rampant throughout the food and water supply. Still, air-chilled chicken makes the world a little-less chlorinated, and that's good for all of us. If you haven't tried our soy-free, certified organic, certified humane, and air-chilled chicken then you're really missing out. You can place your orders here. We believe ours is the healthiest and best-tasting chicken you will experience. March 19, 2015 This Orphan Lamb Is Too Cute! April 24, 2014 Could West Coast Maple Syrup Be A Nutrient-Dense Superfood? June 20, 2012 Why organic farms are the best way to increase "green space"
April 12, 2012 Is food really too cheap? December 26, 2011 Lard, Raw Milk, and Organ Meat: a formula for optimal health?